"African Arabs" redirects here. For Arabs living in North Africa, see North African Arabs. "Afro-Arab" redirects here. It is not to be confused with the Africa-Arabian Peninsula relations of the African Union. Afro-Arab communities were founded in the Nile Valley, as Arabs conquered these lands and arabised the local Nilotic people. Most Afro-Arabs in the Sudans were mainly of Nilotic and Bantu origins, influenced by the old Arabian civilization in language and culture only. In the Maghreb region of North Africa, the black Tuareg can be found, they are Arabised to a great extent and they are another group of Afro-Arabs who are of black Berber origin. 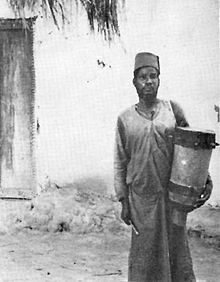 Moreover, the Toubou people are a further group of Africans who have adopted Islam and who have adopted Arab culture in the Arab countries that they live in, like Libya and Sudan. Afro-Arab man of the Congo (ca. 1942). In the Arab states of the Persian Gulf, descendants of people from the Swahili Coast perform traditional Liwa and Fann At-Tanbura music and dance. The mizmar is also performed by Afro-Arabs in the Tihamah and Hejaz regions of Saudi Arabia. The ancestors of these Africans were originally brought to the Arabian Gulf as slaves. But today they are fully recognised citizens of the Persian Gulf States, despite the fact that they do not have any Arab ancestry. ^ Romero, Patricia W. (1997). Lamu. Markus Wiener. p. 7. ISBN 1558761063. Retrieved 25 November 2014. ^ Gunnar M Ahmad Abdel Ghaffar Muhammad Chr Michelsens Institutt (2013). Sudan Divided: Continuing Conflict in a Contested State. Palgrave Macmillan. p. 90. ISBN 1137338245. Retrieved 25 November 2014. ^ Guarak 2011, pp. 7, 401. ^ Hinde 1897, p. 2. Guarak, Mawut Achiecque Mach (2011). Integration and Fragmentation of the Sudan: An African Renaissance. AuthorHouse. ISBN 9781456723569. Mazrui, Alamin M.; Mutunga, Willy, eds. (2004). Debating the African Condition: Race, gender, and culture conflict (illustrated ed.). Africa World Press. ISBN 9781592211456. Mazrui, Ali A. (2014). The Politics of Gender and the Culture of Sexuality: Western, Islamic, and African Perspectives. University Press of America. ISBN 9780761864035. Maho M. Sebiane, « Le statut socio-économique de la pratique musicale aux Émirats arabes unis : la tradition du leiwah à Dubai », Chroniques yéménites, 14, 2007. [permanent dead link].